Santa Monica Press, 9781595800893, 272pp. L.A.'s Legendary Restaurants is an illustrated history of dozens of landmark eateries from throughout the City of Angels. From such classics as Musso & Frank and The Brown Derby in the 1920s to the see-and-be-seen crowds at Chasen's, Romanoffs, and Ciro's in the mid-20th century to the dawn of California cuisine at Ma Maison and Spago Sunset in the 1970s and '80s, L.A.'s Legendary Restaurants celebrates the famous locations where Hollywood ate, drank, and played. 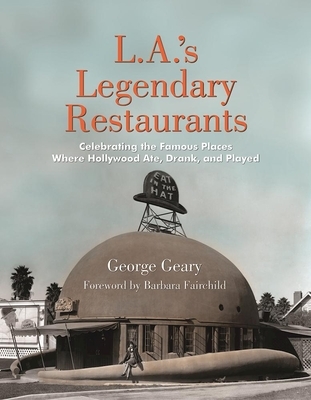 Author George Geary leads you into the glamorous restaurants inhabited by the stars through a lively narrative filled with colorful anecdotes and illustrated with vintage photographs, historic menus, and timeless ephemera. Over 100 iconic recipes for entrees, appetizers, desserts, and drinks are included. But L.A.'s Legendary Restaurants contains much more than the fancy, high-priced restaurants favored by the Hollywood cognoscenti. The glamour of the golden age of drive-ins, drugstores, nightclubs, and hotels are also honored. What book on L.A. restaurants would be complete without tales of ice cream sundaes at C.C. Brown's, cafeteria-style meals at Clifton's, or a mai tai at Don the Beachcomber? Most of the locations in L.A.'s Legendary Restaurants no longer exist, but thanks to George Geary, the memories are still with us.